Dog Soldiers is a gore flick with style, not a splatterfest for the sake of splatter! It's a pure man vs. beast action fest with well written dialog, a good story line and very likable characters, and features werewolves as you've never seen them before. This hidden treasure is worth owning. A military squad is on a routine training mission in a forest in Scotland. Suddenly they are fighting for their lives against sly and deadly werewolves. When their only means of escape disappears, they become sitting ducks surrounded by the vicious predators. Time is running out for the soldiers. They are quickly running out of bullets, and the werewolves are growing more ravenous! Awesome! My new favorite werewolf movie! I watched this movie about 2 weeks ago. I had never heard of it before watching it, and now I find it in this list of recommended films. I agree, because this movie is awesome! This movie is very cool. It's about a group of Scottish weekend warriors who are on a training mission, and they end up encountering some real werewolves. I don't want to spoil it for anyone, so that's all I'll say about the plot - except that the ending blew me away. The dialog is great. People say some pretty funny stuff during the film. 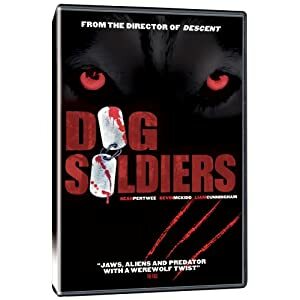 Very entertaining and I highly recommend it for anyone who likes movies about soldiers and/or werewolves.